The majority of today’s enterprises are struggling to manage and store the explosion of data from their clients in the last year. IT organizations have one arm tied behind their backs with decreasing budgets so they are left with bulky old-school storage boxes and Band-Aids. At INFINIDAT we believe in the importance of storage without compromise. Clients should not have to worry about availability, scalability, and performance manageability. Enterprise Storage should be easy-to-deploy and seamless to manage. To do so, we believe in pairing our revolutionary InfiniBox with a strong partner ecosystem to deliver best-in-class datacenter solutions for our clients. As we expand our footprint in Tier 1 enterprise environments, our clients are looking for broader solutions that enable more strategic business transformations — not quick fixes. In combining Brocade’s focus on revolutionizing the datacenter network, and our revolutionary enterprise storage, clients will reap the benefits of greater performance, reliability and availability. 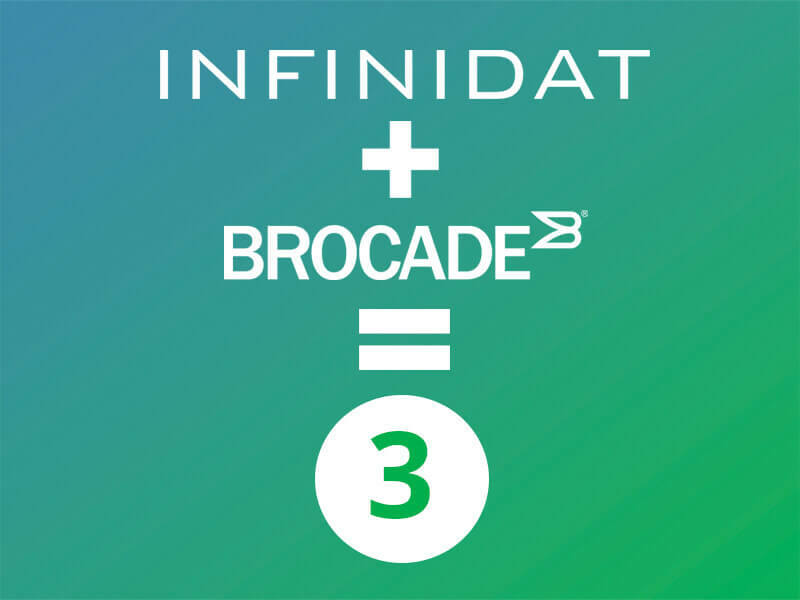 As you may have seen, INFINIDAT recently announced a partnership with Brocade that provides expanded options to our clients and partners today, as well as a foundation for broader innovation for the future. Through our strategic alliance, we can now resell essentially the entire Brocade product portfolio, including Brocade Direct Support and Professional Services, providing a variety of SAN infrastructure service options to match INFINIDAT’s best-in-class enterprise support options. This agreement builds on our already successful collaboration with Brocade in the field and in our test labs. We are also engaged with Brocade in co-development efforts that will deliver new innovations for our clients who use Brocade fabrics. For example, as part of our InfiniBox 2.0 release, we launched our soft target (NPIV) support for Brocade fabrics. Soft target support dramatically simplifies the most essential thing any enterprise-grade storage array must do: maintaining operation during failure scenarios. Besides the resiliency built “inside the box” in most architectures, most storage arrays have a strong dependency on host-side multipathing software with manual configuration. Your storage administrators are probably familiar with exotic incantations in /etc/multipath.conf, mpclaim.exe command lines, or similar mechanics to provide relatively predictable failover behavior when connections are interrupted to your storage arrays. All of that is industry best practice, but we at INFINIDAT do not believe that’s sufficient to be able to deliver on one of our key tenets, our groundbreaking seven-nines availability. Soft targets also enable InfiniBox users to decouple Fibre Channel WWPNs (port identifiers) from the physical Fibre Channel ports of the system. This is useful for a lot of things — for example, better load balancing abilities when connected to imperfectly configured hosts — but in particular it has a direct impact on availability. With soft targets, we no longer have to fully depend on hosts switching paths if some of their InfiniBox connections are disrupted. While we still recommend using multipathing software in most cases, our soft target support largely moves the burden of availability during path failures to within the storage array itself, and dramatically limits the problems that can arise from server multipathing misconfigurations. Soft targets are just one of our unique enhancements for Brocade fabrics. Stay tuned for more details on others that will be available in the future. This next phase of our relationship with Brocade is a great step forward for us and our clients. We look forward to working with our friends at Brocade to deliver even more differentiated value in the datacenter. Erik Kaulberg is a Senior Director at INFINIDAT, leading cloud strategy, key alliance partnerships, and analyst relations. He has broad expertise in enterprise storage and frequently engages key customers, partners, and analysts. Erik previously ran worldwide enterprise storage strategy and business development for IBM, after he sold all-flash array innovator Texas Memory Systems to the company.